This is what summer is all about. 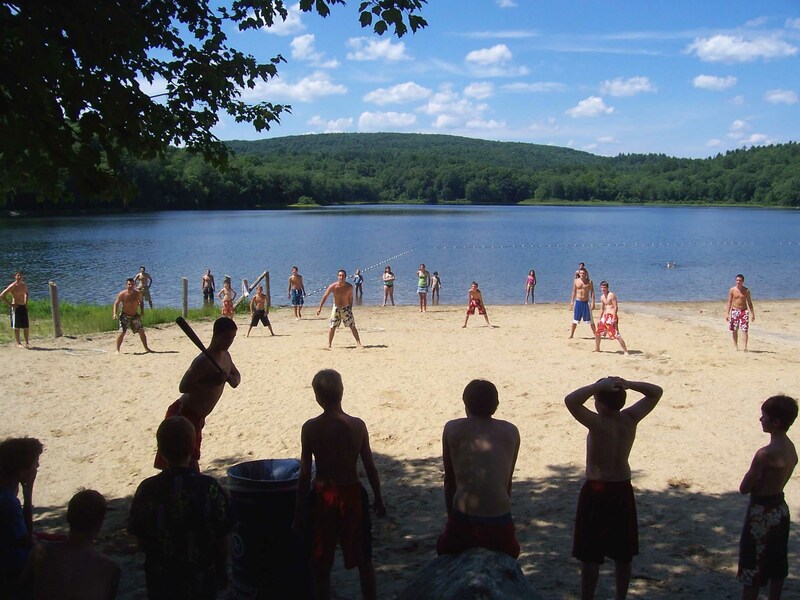 For a week in July over one hundred Barkhamsted kids come together for games, crafts, music, dancing and swimming. Welcome to Summer Camp Week hosted by the Barkhamsted Recreation Commission. It all starts on Monday and goes five days. 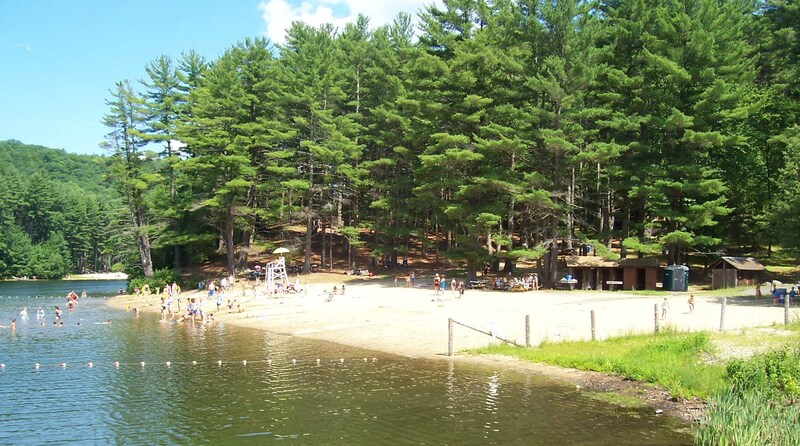 Kids get dropped off at the pavilion at People's Forest for a morning of fun, then shortly before noon they are transported by bus to Goose Green beach on Lake McDonough for lunch and water-oriented activities. At 3:00 p.m. parents drive in the long, winding access road to Goose Green Beach and pick up tired but happy children. The summer camp has a fairly long history. It started in the mid 1980s as an event covering several days. In the early years the camp focused on one topic: Molly Chagum and the legend of the Barkhamsted Lighthouse. In the mid 1990s it expanded to a full week and traded Molly in for more traditional summer camp activities. From the vantage point of the children it is a fun week that many have attended year after year. It is open to pre-kindergarten children (no younger than age 4) on up to grade six. The pre-kindergarten kids go for just half a day from 9:00 a.m. to noon while everyone else attends both the morning and afternoon sessions. What the kids don't see (or care about) is the planning that goes into camp week. The Recreation Director, currently Debbie Brydon, has in place a well oiled machine: time-tested planning and a trained support crew under her direction to carry out those plans. The result weaves together a loose, friendly fun-filled atmosphere with an organized structure that delivers a steady variety of activities, keeping short attention spans firing on all cylinders. 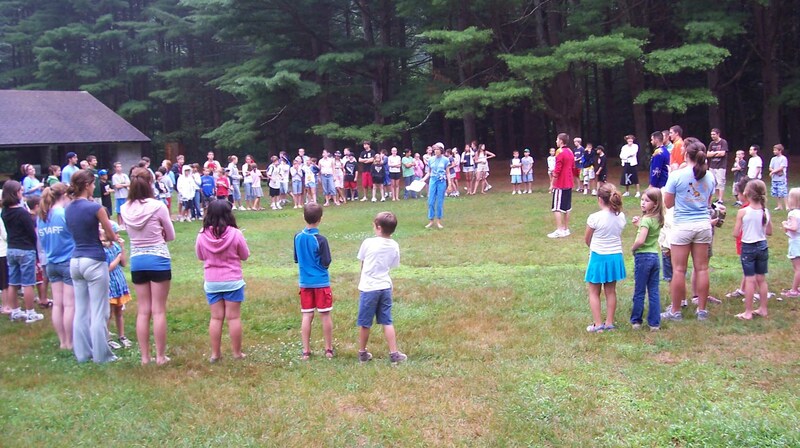 Each day starts out with the campers forming a welcome circle and each person is greeted. Debbie fills everyone in on the planned activities for the day. Then the campers split into groups by age: pre-kindergarten and kindergarten kids in one, first and second graders in another, third and fourth in another and finally the fifth and sixth graders. In 2007 there are so many third graders that for some activities their group splits into two. The camp is limited to a maximum of 125 kids in order to keep things manageable. This limit has been reached in several years, resulting in some kids being turned away. In 2007 the limit was not reached. A total of 110 kids were signed up and a few more added at the last minute. Camp day starts out with the Welcome Circle. Each camper is greeted and Rec Director Debbie Brydon (center of photo, in blue) outlines the days activities. 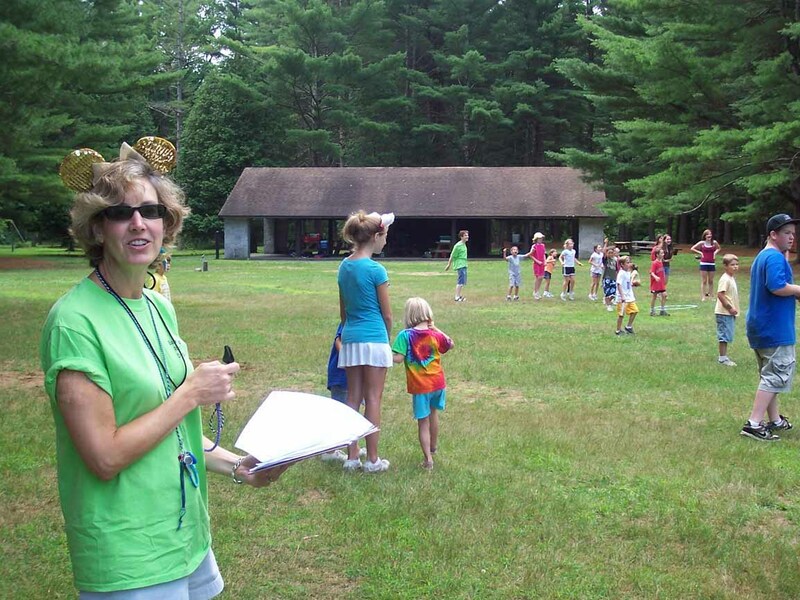 Debbie gets the whistle ready to signal the groups of campers to rotate to the next activity. Debbie wears mouse ears because today's theme is favorite animal day. Director Debbie Brydon and a small team of adults (including a nurse) are assisted by numerous counselors. The counselors are older children or young adults, most of whom are camp veterans. Children just a year or two beyond the sixth grade are "Counselors in Training" (CIT). The next age level are "Junior Counselors". Tenth graders and older are full counselors. There is one counselor for every eight or nine campers and at least one adult (or one of the oldest counselors) is present at each camp activity. One week before camp starts the adults and counselors meet to plan and organize the details. All the children who are registered are assigned to their groups and a telephone and health record is established for each child. Before camp starts, counselors telephone each child to pass along general camp information. After the first day of camp, the adults and counselors meet again to review how things went and iron out any issues that may have come up. Campers are encouraged to wear clothing/costumes reflecting the day's theme. For example, on Rock and Roll day some of the counselors wore uniforms reminiscent of the Beatles' Sergeant Pepper. In addition, one or more activities during the day are tied in to the theme. On Friday, "Dress Your Counselor Day" requires the Counselors to wear clothing brought in by the campers. Of course the intent is to embarrass the Counselor to the fullest extent possible. This year as in previous years, the shortest path to successful embarrassment focused on cross dressing, especially for the older male counselors. Campers chose such things as painted nails, boas and head gear topped with fruit as the favored tools for the task at hand. During camp week, a steady line of cars descend on the main area at People's Forest just before 9:00 a.m. Parents drop off one or more children, over one hundred in all. The kids stream into the meeting area laden with backpacks stuffed with snacks, lunch, swimsuits and all the necessities of a day at camp. Shortly after 9:00 a.m. Recreation Director Debbie Brydon gets things started with a couple of blasts from her whistle and the campers form up into the welcome circle where greetings are handed out and announcements made. Camp day is off and running. The morning is spent at People's Forest. The counselors gather their assigned campers and each group begins the first activity of the day. Several activities are going on at the same time and each group of children rotates between them. On a given day the morning activities might be include such things as: 1) games, including kickball, relay races or a hoop and ball game; 2) music and dancing; 3) tie-dying a t-shirt; 4) planning and constructing a flotation device to be used in a water race. Debbie, keeping an eye on the time, uses her whistle to signal the groups to rotate. At mid-morning the groups come together for a snack. As Debbie pours out the liquid refreshment to the campers, she addresses each by name. This turns into a game as the children hope she will not remember their correct name. Maybe this time she will call me Jake instead of Jack! But to the delight of the children, Debbie rarely slips up. 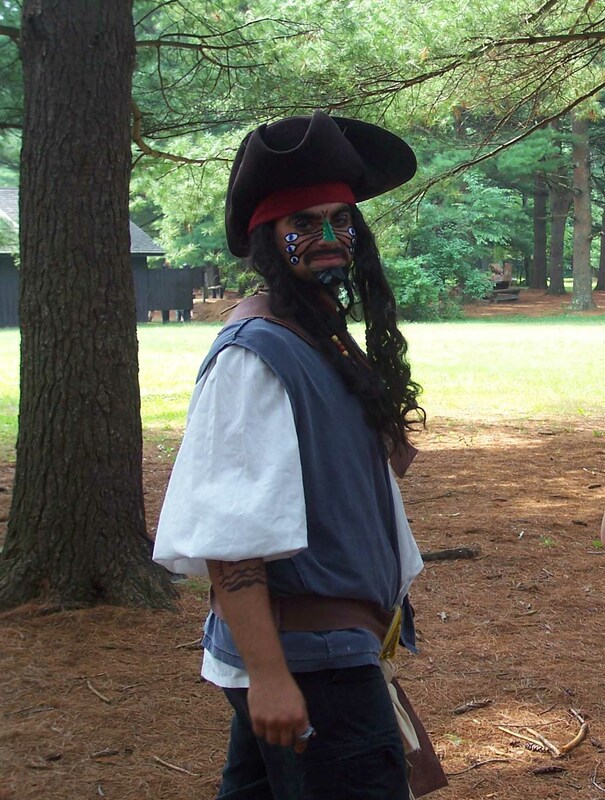 This is pirate day and Camp counselor Chris Rood is dressed for the part. At about noon the groups congregate once again, this time under the People's Forest pavilion. 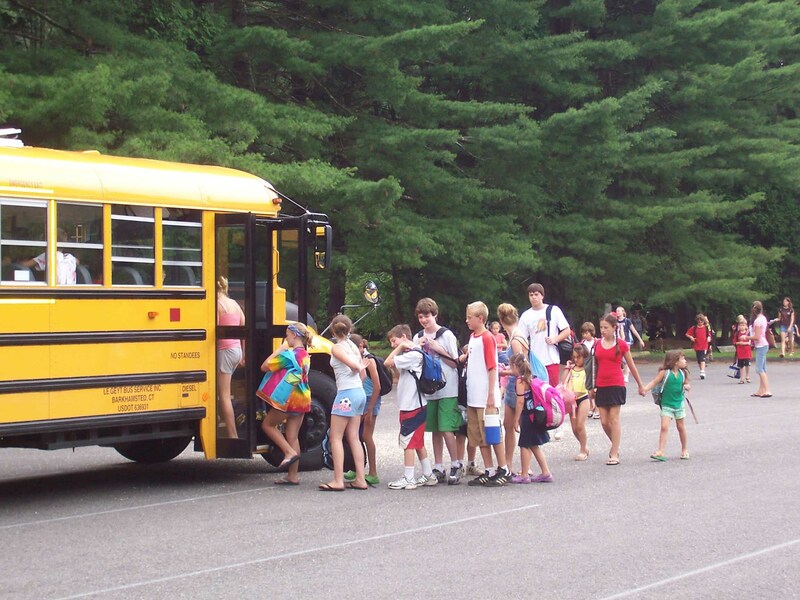 It is time to board the two school buses for the ride to Goose Green Beach (located on Lake McDonough). The afternoon activities will be held there. The children are quiet as they sit at the pavilion picnic tables. The group that is the most quiet and well behaved will be dismissed first to board the bus -- an honor that all strive for. At Goose Green, the first order of business is lunch. Campers head toward the same picnic table that they staked out on the first day and eat lunches brought from home. At Goose Green the camp routine is a little more relaxed. After lunch, the activities include swimming, hiking and just hanging out. The time is less structured and the groups break up into smaller units, but still with at least one counselor. In addition to these activities, there are also three special activities at Goose Green, and each camper chooses to participate in one of them. They are the wiffle ball tournament, the sand sculpture contest and the arts and craft activity called boondoggle which is the weaving and knotting together of flat plastic strings called "gimp" into simple objects like a friendship band or more complex, artistic creations. The sand sculptures are works of art made from the beach sand and can be worked on all week if desired. The sculptures are judged and a prize awarded on Friday, the last day of camp. The wiffle ball game is actually a tournament: five games in five days. The competition is keen between the same two teams (the Cincinnati Heaters versus the Cleveland Beavers), each vying to win the tournament and the trophy, which is presented on the last day. The name game...Debbie pours out lemonade for two campers. While serving the lemonade, she greets each camper by name. Pretty amazing since there are over 100 campers! One of the camp activities: tie dying t-shirts. Here the t-shirts are being hung up to dry. This activity is on the grounds of the Squire's Tavern at People's Forest. At the end of camp week when the t-shirts are done, each camper will have counselors and other campers sign their shirt with indelible ink pens. As three o'clock approaches, the parents start to trickle in to pick up the campers. Debbie blows her whistle and has everyone form a circle for the ritual performed at the end of each day. This is the "Humpty-Dumpty" song. The tune is the same for each verse and the words are supplied from a variety of nursery rhymes. It is rhythmic, almost like rap, and each verse ends with "ain't that funky now!". The kids really get into it. This brings to a close a typical day at Camp. Throughout camp week there are special events scheduled. 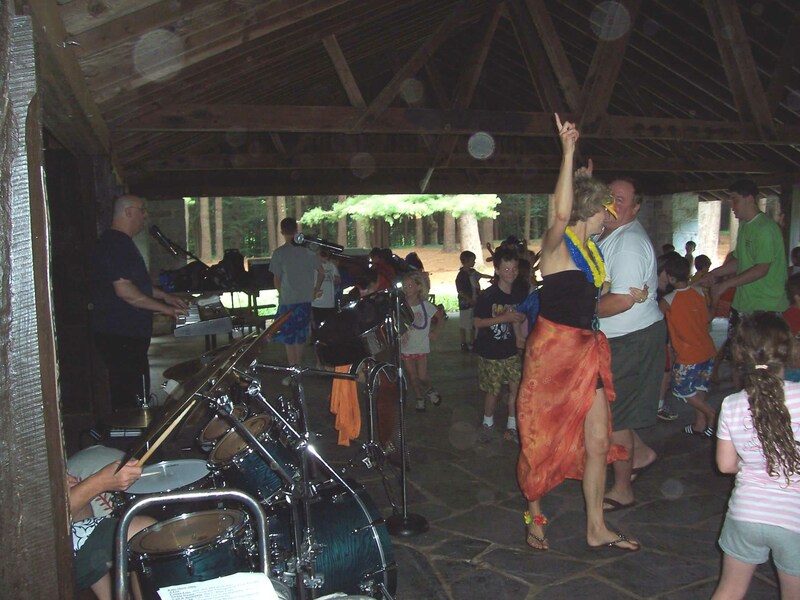 This year one such event (on Tuesday) was the "Island Rhythm" band, a high energy, rapid fire group that belts out live music simultaneously with a variety of activities such as dancing and ball bopping. The band is excellent and they know how to get the campers revved up. Another event was a visit by world champion lumberjack competitor Mike Sullivan from the nearby town of Colebrook. Mike has competed nationally and internationally and has won world titles many times in his career. He still competes, but now does fewer competitions. For the campers, he demonstrates competition wood chopping. After a short demonstration of just how sharp the axe is (it cuts a piece of paper like a razor), Mike chops through a pine log, his powerful swings producing huge chips. Then for the saw cutting demonstration he brings out what looks like an ordinary chain saw. In nine seconds he saws through a 12 inch pine log. The campers are impressed and applaud the display. But wait -- that was a setup! Mike now brings out his actual competition saw...the "Super Saw". It is black and it is BIG. It has a snowmobile engine for a motor and when he fires it up, it fills the whole valley with its roar. Mike has the campers cover their ears and shout out the count down as he prepares to saw the log: three...two...one...GO! In a blink of eye the log is cut as the saw dust flies. Done in 1.5 seconds! Another special event is the float race. During most of the week the campers (in groups) have been working on their floats as a teamwork activity. Each group is given the same materials to construct a float, including long flotation "noodles". On the last day of camp, the various float creations are put to the test. The race involves two floats in head to head competition. They start at the beach, going out to a buoy located in deeper water, and then back to the beach. After the first round, the winners of each race take on each other. The overall winner this year was one of the groups comprised of sixth graders. Also on the last day of camp, two other awards are handed out: one for the sandcastle competition winner and one for the team winning the wiffleball tournament. The trophies are designs carved out of Catalpa wood by Mike Sullivan, using a chain saw. Just this year (2007) he has donated the castle trophy used for the sandcastle competition (see photos of both trophies). The wiffleball competition came down to the wire. Over the first four days of the week the teams had each won two games. The tie was broken with the fifth game on Friday and the Cleveland Beavers were the victors. The sandcastle competition was judged by the two lifeguards (both MDC employees; it just so happened that these same two lifeguards had judged the competition last year). The judges were so impressed by the quality of the sandcastles that they could not identify one single winner. The trophy was awarded to the artists of all seven entries to the delight of the campers (the trophy will be displayed at Town Hall). The busy Friday brings to a close another year of Camp Week. This will be the last one for Debbie Brydon as Recreation Director. After 11 years in that role she is stepping down. Over the years she has worked hard to improve the camp experience for the kids and has done it successfully. It is easy to see why over 100 campers attend, and keep coming back year after year. Debbie has done an excellent job planning, organizing and directing the activities. It is very apparent that she enjoys the week and her enthusiasm spreads to the counselors and campers, helping to make it an enjoyable experience for all. On Friday the counselors and adult staff showed their appreciation of not only Debbie's years of service, but also her spirit and good humor. They provided a gourmet lunch for Debbie and later, with the area decked out with large balloons, they presented her with a flower bouquet. After a speech with kind words, Debbie was thrown into the warm waters of Lake McDonough. Boarding the bus at People's Forest for the trip to Goose Green Beach. Each year the LeGeyt Bus Company generously donates without charge two buses with drivers to meet the transportation needs of the campers, thus helping to keep the cost of camp week low (camp week costs $115 per child). Island Rhythm Band belts out some dance tunes and gets the campers (and Debbie) hopping at the pavilion at People's Forest. 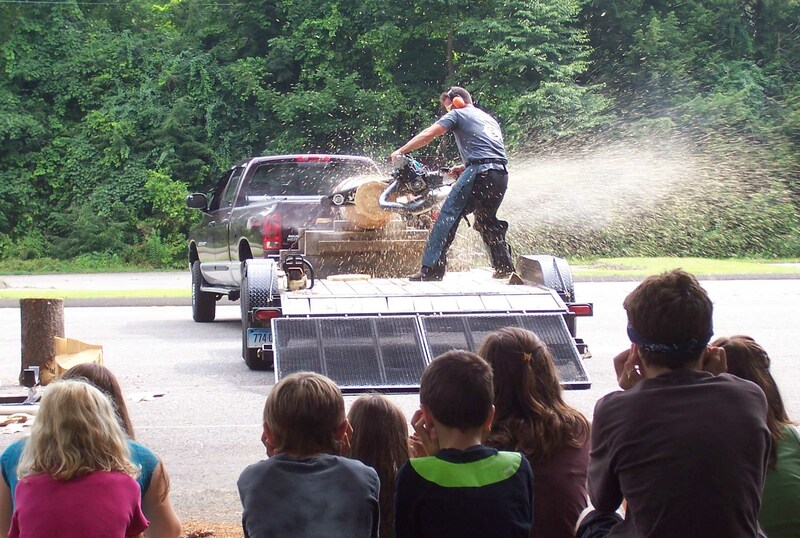 The sawdust flies as lumberjack Mike Sullivan demonstrating the Super Saw to the campers. 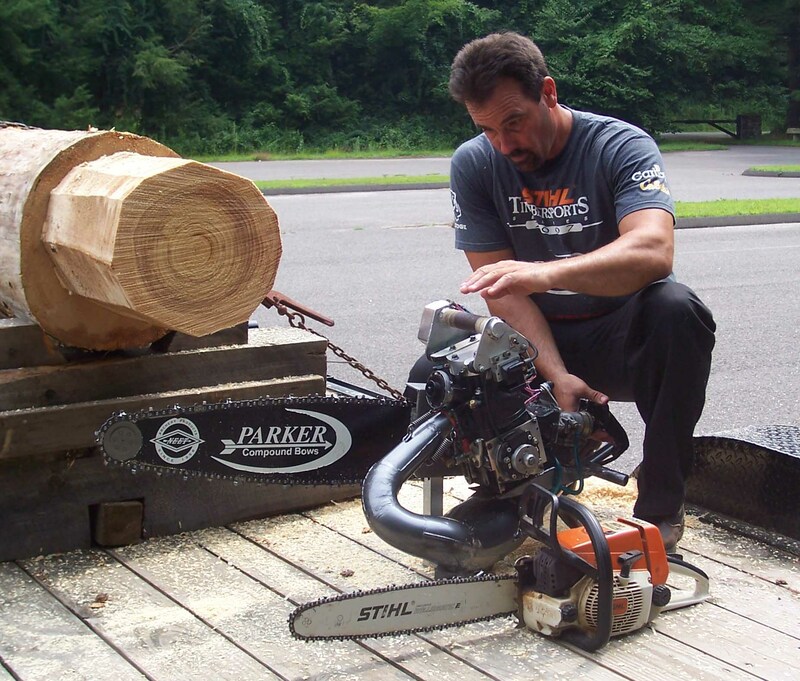 Mike Sullivan compares his competition "Super Saw" to a regular chain saw. Can you tell which is which? Mike Sullivan's demonstration of his lumberjack skills is one of the highlights of camp week as these eager autograph seekers can attest. Goose Green Beach is where afternoons are spent during camp week. Two MDC lifeguards keep an eye on the campers in the water. Beach wiffleball. Trash talking is exchanged as campers vie for bragging rights and the tournament trophy (best of five games). A ball landing uncaught in the water is a home run. A ball hitting the trash can behind the batter is a strike. 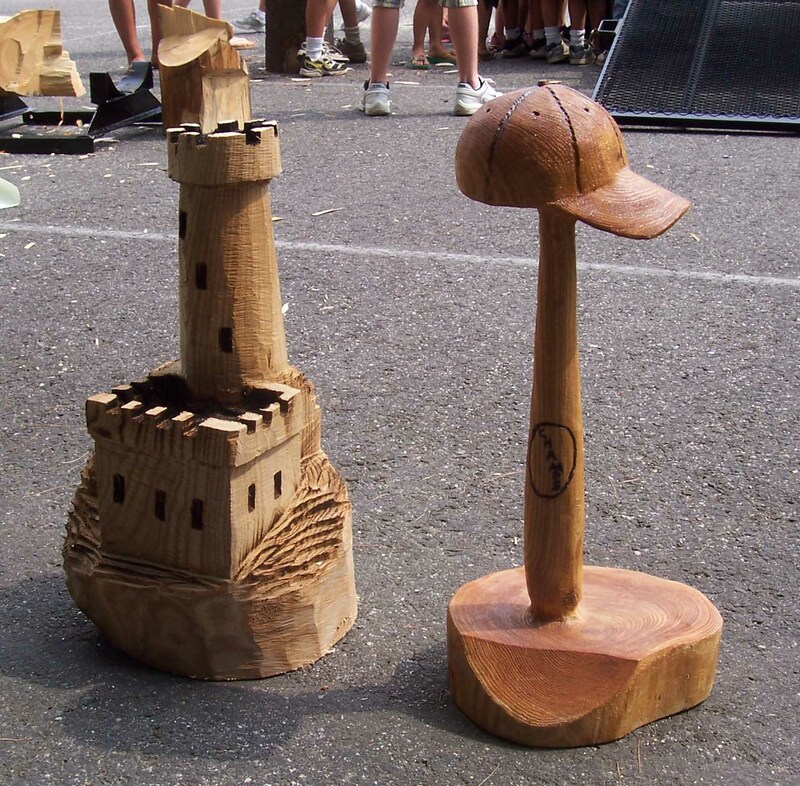 Trophies for the sand sculpture competition (left) and the wiffleball tournament. These were made for the campers by Mike Sullivan. Rec Director Debbie and some of her crew, posing here with Mike Sullivan. From the left (front row)- Kelsey Lamoureaux, Brendan Fritch, Chris Parrott, Kyle Fritch, Alex Lamoureaux. Back row from left- Chris Rood, Josh Seibold, Dannielle Lamoureaux, lumberjack Mike Sullivan, Debbie Brydon.